A 15-year-old malnourished girl presented with a pus discharging sinus in left flank for four years. There was no fever, anorexia, weight loss, respiratory, urinary or bowel symptoms. On examination, there was a sinus draining purulent material in posterior aspect of left lumbar region with surrounding excoriated skin. Examination of chest and abdomen was otherwise unremarkable. Escherichia More Details coli were grown in culture of urine. Urinary tests for fungus and tuberculosis were negative. Sinus edge biopsy revealed inflammatory granulation tissue without any evidence of tuberculosis or malignancy. Plain radiograph of kidney, ureter and bladder (KUB) region revealed a staghorn calculus on left side. Contrast study done through sinus in the lumbar region showed deformed and irregular renal calyces with a large calculus in the left kidney and multiple irregular tracts extending from left renal pelvis into mediastinum [Figure 1]. Renal scan was done which showed non-functioning left kidney with a differential function of 3% and glomerular filtration rate (GFR) of 1 mL/min. The other kidney was functioning normal. 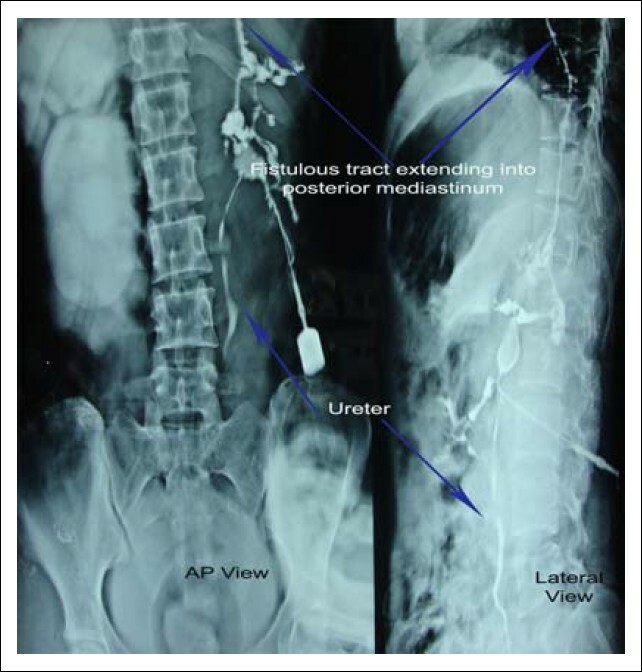 Figure 1: Sinogram (AP and lateral view) showing fistulous tracts extending into mediastinum. The kidney was explored through left subcostal incision. Gerota's fascia was thickened, edematous and had dense adhesions with surrounding structures. The kidney was enlarged with dilated pelvicalyceal system filled with staghorn stone and pus [Figure 2]. Multiple fistulous tracts were delineated after injecting methylene blue dye through sinus opening in the lumbar region. Further dissection of fistulous tracts revealed its extension into the posterior mediastinum through lumbocoastal triangle of diaphragm on the left side. Nephrectomy, excision of fistulous tracts and curettage were performed. Incision was closed after putting 30 F drain in the left renal space. Detection of methylene blue dye in endotracheal tube aspirate confirmed the extension of fistulous tract into the bronchial tree. Chest radiograph done in the postoperative period did not show any abnormality. The drain was removed on the fifth postoperative day. The patient made uneventful recovery and was discharged on the eighth postoperative day. Histopathological examination of the kidney showed XGP with nephrolithiasis and fistulous tracts lined with inflammatory granulation tissue. The patient became asymptomatic after surgery, and computed tomography done three months later showed no abnormality. 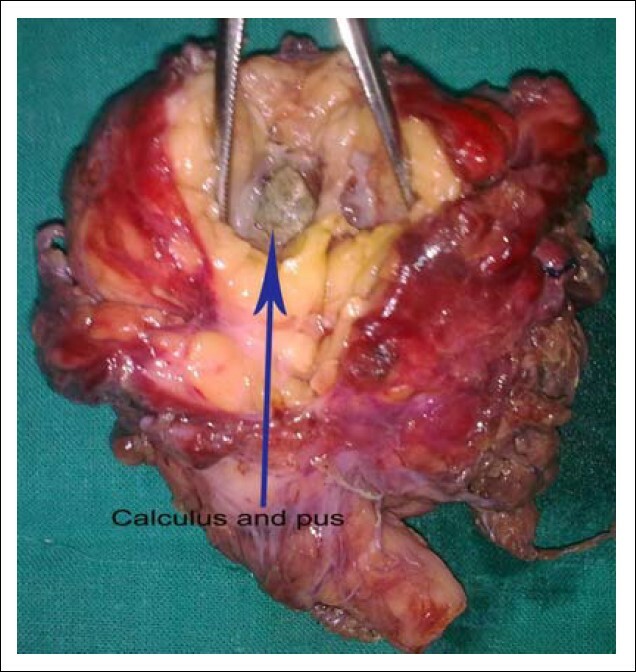 Figure 2: Specimen showing calculus and pus in the collecting system. Nephrobronchial fistula is an extremely rare complication of XGP, an atypical form of renal infection characterized by the tendency for invasive behavior, extension to adjacent structures, and organs, resulting in formation of fistulae. Urinary tract obstruction, congenital urological anomalies, and recurrent urinary tract infections are mostly the accompanying disorders. Infection by human immunodeficiency virus, association with diabetes mellitus and the presence of untreated renal stones are some of the predisposing factors. ,, There are two forms of XGP. The diffuse or global form (85%) is more common than the localized, focal or segmental form (15%). Diffuse XGP is staged as follows: Stage I, involvement is limited to kidney; Stage II, involvement extends to the renal pelvis or the perirenal fat within Gerota's fascia; and Stage III, involvement extends beyond Gerota's fascia into the retroperitoneum, other organs, or both. The tendency of perirenal inflammation to spread superiorly was described by Evans and coworkers,  who noted that the lines of fusion of renal fascial planes tend to direct the exudates within the retroperitoneal compartment. The lumbocoastal triangle, a relatively weak area of diaphragm, can transmit infection into the thoracic cavity. Although there are reports of successful management using conservative measures,  surgical drainage or nephrectomy remains the cornerstone of treatment. However, a nephrectomy may be complicated by possible respiratory complications intra- and post-operatively. Our case, Stage III XGP and coexisting nephrolithiasis which involved perirenal and pararenal tissues with consequent nephrocutaneous and nephrobronchial fistulization, was managed successfully by nephrectomy and excision of fistula. This case illustrates the natural history of nephrobronchial fistula and the relevance of early treatment of nephrolithiasis. 1. de Souza JR, Rosa JA, Barbosa NC. Nephrobronchial fistula secondary to xanthogranulomatous pyelonephritis. Int Braz J Urol 2003; 29:241-42. 2. Alifano M, Venissac N, Chevallier D, Mouroux J. Nephrobronchial fistula secondary to xanthogranulomatous pyelonephritis. Ann Thorac Surg 1999;68:1836-87. 3. Blight EM. Case profile: Nephrobronchial fistula due to tuberculosis. Urology 1980; 15:526-7. 4. Arida EJ, Verderame D. Nephrobronchial fistula: Resulting from perinephric abscess. NY State J Med 1977;77:2276-78. 5. Doughney KB, Dineen MK, Venable DD. Nephrobronchial colonic fistula complicating perinephric abscess. J Urol 1986;135:765-77. 6. Biyani CS, Torella F, Cornford PA,Brough SJ. Xanthogranulomatous pyelonephritis with bilateral nephrocutaneous fistulae. Urol Int 1997;59: 46- 47. 7. Majeed HA, Mohammed KA, Salman HA. Renocolic fistula as a complication to xanthogranulomatous pyelonephritis. Singapore Med J 1997;38: 116-9. 8. Gibbons CE, Smith AL. Xanthogranulomatous pyelonephritis:a rare case of fistula between colon and kidney. J R Army Med Corps 1997; 143:49-50. 9. Srinivasan A, Mowad JJ. Pyelocutaneous fistula after SWL of xanthogranulomatous pyelonephritic kidney:case report. J Endourol 1998;12:13- 4. 10. Harisha RA, Nath SK, Thomas JA. Xanthogranulomatous pyelonephritis with reno-colonic and cutaneous fistulae. Br J Urol 1987;60:273-74. 11. Kiris A, Kocakoc E, Poyraz AK, Dagli F, Boztosun Y, Xanthogranulomatous pyelonephritis with nephrocutaneous fistula and coexisting renal replacement lipo-matosis:The report of a rare case Clinical Imaging 2005;29:356-58. 12. Parsons MA, Harris SC, Grainger RG, Ross B, Smith JA, Williams JL. Fistula and sinus formation in xanthogranulomatous pyelonephritis. A clinicopathological review and report of four cases. Br J Urol 1986;58:488-93. 13. Yildiz K, Kose N, Ozdamar S. Xanthogranulomatous pyelonephritis in a child presenting with cutaneous fistula. Aegean pathology. 2005;2: 77-79. 14. Caberwal D, Katz J, Reid R, Newman HR.A case of nephrobronchial and colonobronchial fistula presenting as lung abscess. J Urol 1977;117:371-73. 15. Calvo Quintero JE, Alcover Garcia J, Gutierrez del Pozo R, et al. Fistulization in xanthogranulomatous pyelonephritis. Presentation of 6 clinical cases and review of the literature. Actas Urol Esp. 1989;13:243-46. 16. Rao MS, Bapna BC, Rajendran LJ, et al. Operative management problems in nephrobronchial fistula. Urology 1981;17:362-63. 17. Dunnick NR, Sandler CM, Amis ES, Newhouse JH. Renal inflammatory disease. In: Dunnick NR, Sandler CM, Amis ES, Newhouse JH, eds. Text-book of uroradiology. 2nd ed. Baltimore: Williams & Wilkins; 1997. p. 163-89. 18. Evans JA, Meyers MA, Bosniak MA. Acute renal and perirenal infections. Semin Roentgenol. 1971;6:276-91. 19. Qazi HA, Manikandan R, Holmes ME, Philip J, Parksons KF. Nephrobronchial fistula: A case report. Int Urol Nephrol 2007;39:31-2. 20. O'Brien JD, Ettinger NA. Nephrobronchial fistula and lung abscess resulting from nephrolithiasis and pyelonephritis. Chest 1995;108:1166-68. 21. Kyriakopoulos M, Stathopoulos P, Kourti A, Pandis B. Nephrobronchial fistula: Case report. Scand J Urol Neph 1991;25:245-46. 1 Coughing up urine: Urinoptysis? Kadaria, D. and Sarva, S.T. and Deaton, P.R.